Kortrijk, Belgium (April 23, 2018) – The sales, services, and marketing teams from Cinionic – Barco’s cinema joint venture – are now brought together with Barco’s cinema manufacturing and engineering departments at one location in Kortrijk (Belgium). With a focus on automation and innovative technologies, Barco’s brand-new and state-of-the-art production facility “The Engine” is geared to create the cinema projectors of the future, both in terms of volume and technology. At “The Engine,” Barco builds its cinema projectors, lamp-based but primarily laser illumination-based projectors. The different laser technologies like RGB and laser phosphor are manufactured, assembled, and tuned there to match the best light performance possible. This includes the laser retrofit engines that allow exhibitors to upgrade their lamp projectors with smart laser technology. Bringing 250 people to Barco’s One Campus in Kortrijk, the production facility covers 15,000 sqm (161,458.66 sqft) in total, including 1,500 sqm (16,145.87 sqft) state-of-the-art clean rooms. Focused on operational excellence, automation, and quality, the manufacturing site increases efficiency and allows for more flexibility and faster turnaround time. The new flow shortens production lines as the different steps are brought closer to each other. “Thanks to “The Engine,” we are ready for the upcoming demand, bringing the next wave of cinema technology to our exhibitors to deliver at their request. The close cooperation between engineering and manufacturing at the new facility results in better products,” said Wim Buyens, CEO of Cinionic. 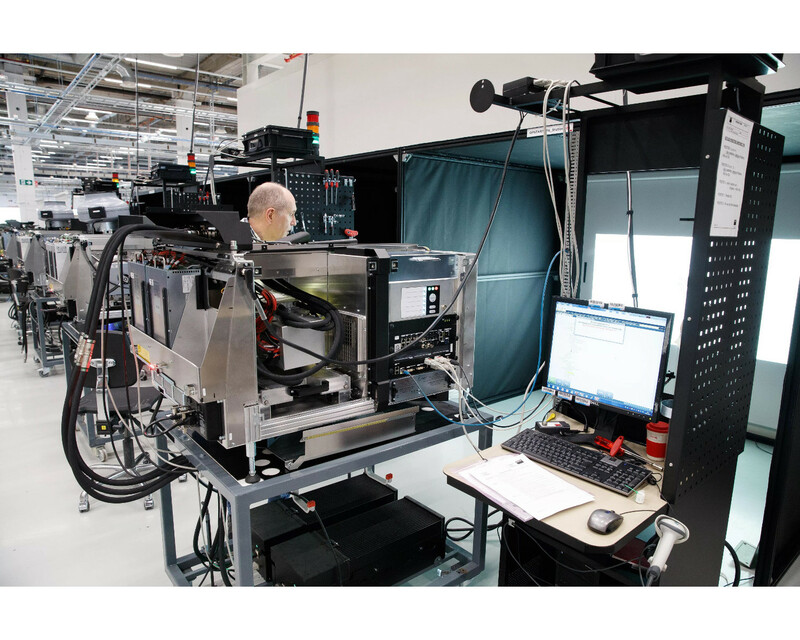 The Engine features an investment in a multimillion-dollar clean room where Barco makes its sealed optical engines. This patented engine cooling is a hallmark of Barco cinema projectors. Thanks to the patented sealed enclosure, no contamination can affect the optics of the DLP cinema chips, which guarantees undiminished brightness and contrast. These high-quality optics guarantee a flawless image quality for a stunning movie experience. The core of the Factory of the Future is a clever way of working that encompasses different pillars. This includes digitally connecting employees and systems worldwide as well as automating the warehouse (fully operational beginning 2019) and key assembly activities.